Metropolitan Opera fans will enjoy this up-close-and-personal look at one of the world’s best conductors. 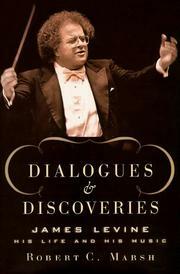 Of the contemporary conductors worthy of a book, none is perhaps as deserving as James Levine. The artistic director of the Metropolitan Opera and an important developer of the Chicago Symphony’s Ravinia Festival, Levine has earned his place as one of the most influential men to lift a baton since orchestras first began using conductors in the mid-19th century. Marsh, who was chief music critic at the Chicago Sun-Times for 37 years, puts Levine in context by providing a close look at the conducting and classical music world. In order to better illuminate Levine’s expertise, Marsh segues into short histories of the evolution of conducting, the development of other conductors’ and their influence on Levine, and various developments in classical music itself. His analysis of Levine’s conducting style is especially useful, for it gives a reader less versed in the nuances of classical music a handle with which to watch and understand what Levine and, indeed, all conductors do as they wave their batons. The book is divided into two sections: dialogues from miscellaneous interviews Levine has given over the years, and a more strictly biographical section that provides a broad overview of Levine’s life. Although the dialogues could have used more focus, this section works best because Marsh mostly stays out of Levine’s way and lets the man tell his own story. Marsh’s habit of unnecessarily injecting himself into events makes the writing stilted at times and leaves the reader questioning whether Marsh can effectively analyze someone with whom he is also friendly; his tendency toward sweeping statements can raise doubts as well. The book concludes with a complete Levine discography and his total repertoire. Quibbles aside, a useful overview of a momentous man and his music.